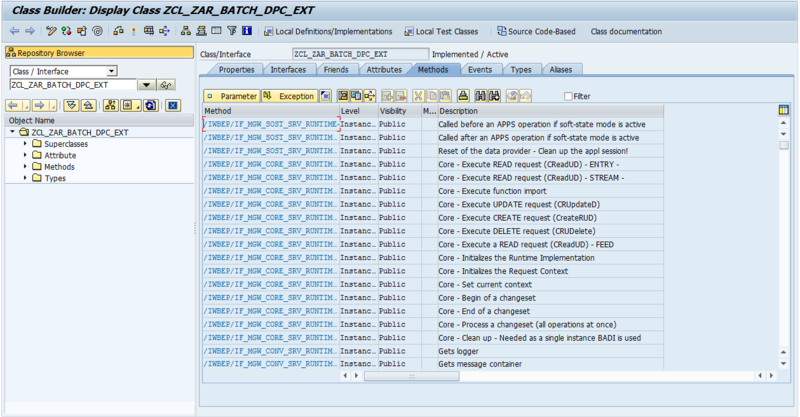 In this post I am going to write about how to perform batch operations in OData using ABAP ECC server and SAP NetWeaver Gateway. 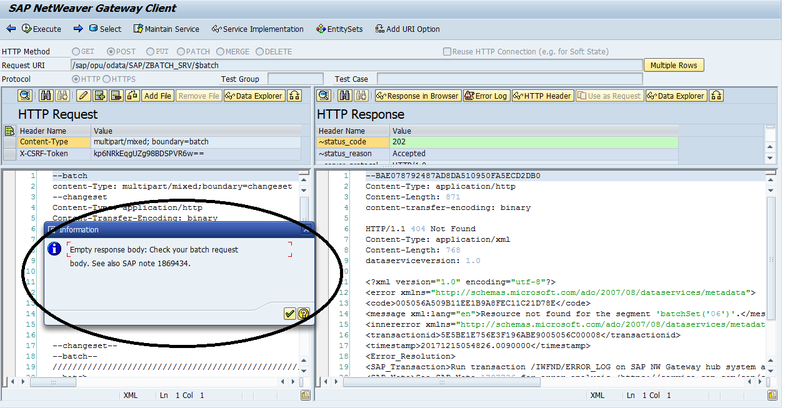 Now double click on the DPC_EXT class in the runtime artifacts. The following screen should appear. EntitySetName_GET_ENTITY – To output a single record. EntitySetName_GET_ENTITY_SET – To output multiple records. EntitySetName_CREATE_ENTITY – To create a record. EntitySetName_UPDATE_ENTITY – To update existing record. EntitySetName_DELETE_ENTITY – To delete existing record. /IWBEP/IF_MGW_APPL_SRV_RUNTIME~CHANGESET_BEGIN – For batch operation. /IWBEP/IF_MGW_APPL_SRV_RUNTIME~CHANGESET_END – For batch operation. read table it_key_tab into wa_key_tab1 index 1.
select single * from zarjun_batch_h into er_entity where userid = wa_key_tab1-value. select * from zarjun_batch_h into table et_entityset. 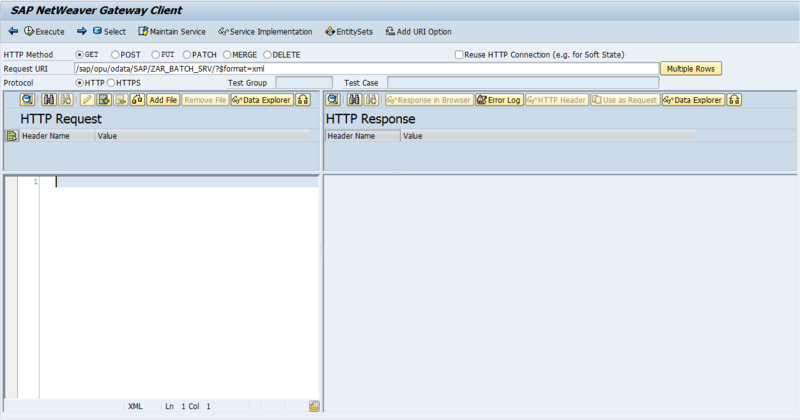 io_data_provider->read_entry_data( importing es_data = wa ). insert into zarjun_batch_h values wa. read table it_key_tab into wa with key name = 'Userid'. delete from zarjun_batch_h where userid = wa-value. Next step, check the code using CTRL + F2 and activate using CTRL + F3. To execute any batch operation, we have to use the $batch URI. That’s basically it. Using the above methods you can perform any batch operations on any number of entity sets in one HTTP request only. 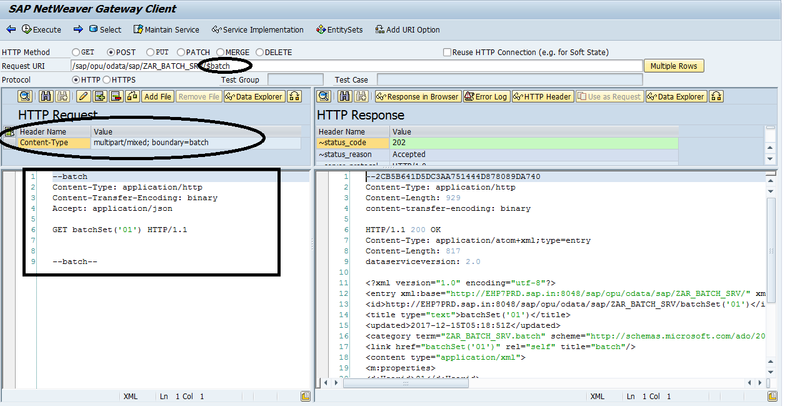 The output can be both checked at the HTTP Response, a well as from SE11. This happens even when you miss a line while writing the HTTP Request. Any batch request starts with the “–batch” statement and ends with the “–batch–” statement. or just I leave it in blank? Thank you for the comment. Yes, you have to leave the two methods blank. Just redefine them and activate your DPC_EXT class. Don’t write any code in them. But then where we need to write the below highlighted code, which you have written for – BATCH UPDATE (PUT) OPERATION and what URI we need to give to the Frontend developer to call ? 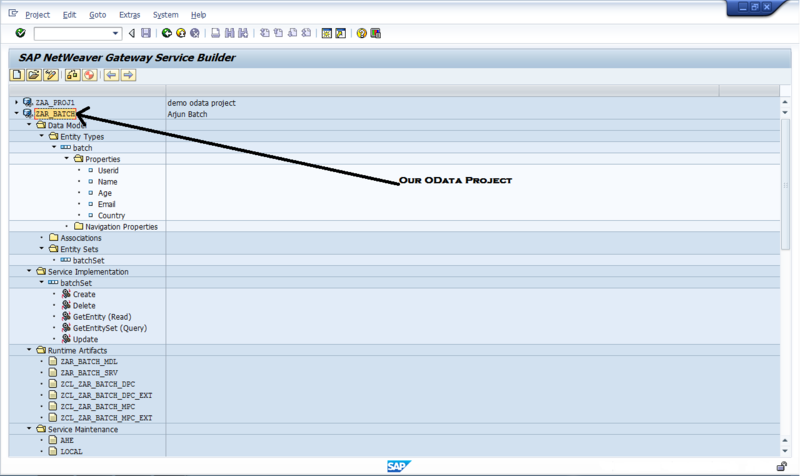 I have a requirement where we need to approve multiple Sales Orders by selecting from the Master page of the Fiori App. So from ODATA , how can I implement this ? RFC Error: The current application triggered a termination with a short dump. But single entry is working fine. Hi Arjun Biswas , are you really able to update records? If you put a breakpoint in your UPDATE_ENTITY method, does it fire up? When I put breakpoint in CREATE_ENTITY method, it fires up but not for UPDATE_ENTITY. I experienced this with my PUT method. I specified merge: false and i was able to fire up my UPDATE_ENTITY.